Last week (March 31-April 6) was Rare Book Week in Manhattan. The week was awesome, if exhausting. There was one event I wish I hadn’t bothered to go to (title of event withheld to protect the well-intentioned), and another, the Fine Press Book Fair, which deserved way more time than I had. But what about the bindings, you may ask? The ABAA fair was full of them. I barely scratched the surface. The award for Best in Show was independently awarded, both by me and Richard Minsky. We kept going back to visit it. I showed it to whomever I thought might care. Those guys at Chez Les Libraires Associés (Paris) were bemused, baffled, and finally, resigned to the attention. It’s a first edition, first issue of Camus’ L’etranger bound by Pierre-Lucien Martin, who was widely considered to be the successor to Bonet, in the 1950s. It stole the show. I also saw some great North American bindings. 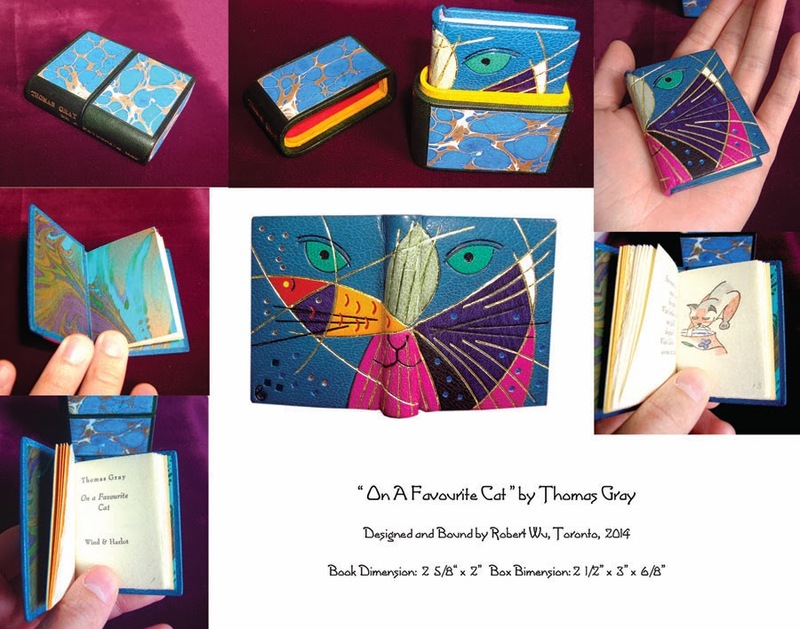 Robert Wu‘s miniature “On a Favorite Cat” by Thomas Gray is a jewel. It really wanted to come home with me, but my bank balance forbade it. Bromer’s had that Wu, as well as a full size Michael Wilcox with a matching mini. Take a look at Bromer’s Facebook page for images of their booth. The Wilcox is on the upper left. That’s a Silvia Rennie on the bottom shelf in the middle. The collection of miniatures the Bromers commissioned for the book fair is arrayed in the front case. I’d like to point out that, as far as I could tell, all but one book in this group was bound by either a fellow or licentiate of Designer Bookbinders (UK). Robert Wu is a Canadian practicing in Canada (yay Americas!) and therefore not eligible for DB. I saw a pair of Tini Miura quartos (Barbier, George and Georges LePape–Louys, Pierre. Aphrodite. Paris: Les Bibliophiles de L’Amerique Latine, 1954) at Sims-Reed which were not on display because they had already been sold. They were very nice and showed them to me twice. I suppose it helps that I have known them for more than a decade. 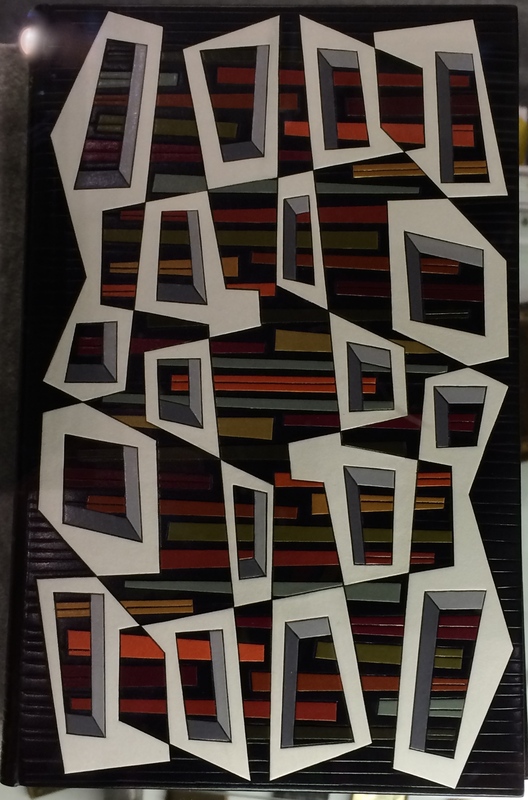 Priscilla Juvelis had a new Donald Glaister that I didn’t have a chance to get a close look at, but she promised me some pictures. I’m so grateful to Priscilla. 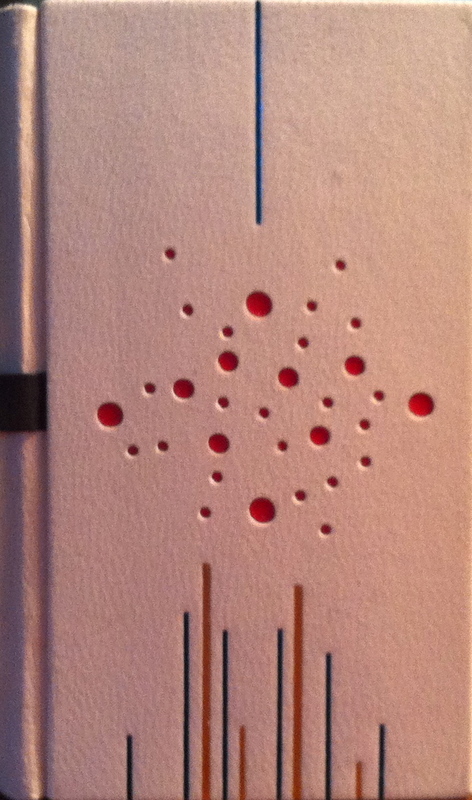 I finally got a chance to sit down with her and talk about design binding and other book arts. She is so kind and generous. I can’t wait to speak with her again. 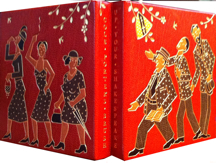 My buddy Melissa Sanders of Red Queen Book Arts introduced me to the work of David Esselmont, resident of the USA since 2005, and showed me a mock-up binding by Jim Croft. At the Fine Press Association fair, I saw some of the books that have been bound for the Contemporary Bindings of Fine Press Books exhibit and had a great conversation with Graham Moss of Incline Press. Nine binders chose books from his press to bind for the exhibit. I can’t wait to see the results. Also at the Fine Press fair, I met and spoke briefly with Coleen Curry who is not only beautiful and delightful, but also a fantastic binder. She has lots of pictures on her website which is a must see. I also met the elusive Lang Ingalls, binder and fine printer. Erin Fletcher recently wrote a month-long feature on Lang on her blog A Flash of the Hand, which shows more of Lang’s bindings in one place than I have ever managed to ferret out (that’s why I said elusive — I’m sure I could have simply asked for pictures). Definitely take a look.